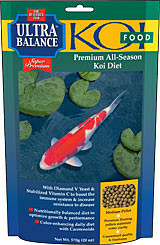 ULTRA BALANCE ALL SEASON KOI FOOD is a color enhancing floating pellet containing high quality ingredients to optimize the growth, health, and performance of your Koi. Formulated for warmer water temperatures above 64 °F (18°C) & above.Medium Pellet - Approximately 1/8"
Provides the essential amino acids; the key to health and growth for building strong body tissue, scales, muscle and a healthy nervous system. Features fermentation metabolites, MOS and beta-glucans – stimulating the immune system, stabilized gut microflora and improve digestibility to provide optimal nutrition to assist in keeping your fish healthy. Needed for a balanced metabolism, skeleton formation, nerves, body fluid regulation, enzymes, and improved immune system. Pigment that helps develop the brightest colors in your fish. Maintains water clarity for the enjoyment of your pond. Cleaner water means healthier fish. The pellet size is approximately 1/8"